Launched only a week or two before EA sports’ NBA Live 15, 2K’s own basketball game NBA 2K15 inevitably shows some, but not a lot similarities. 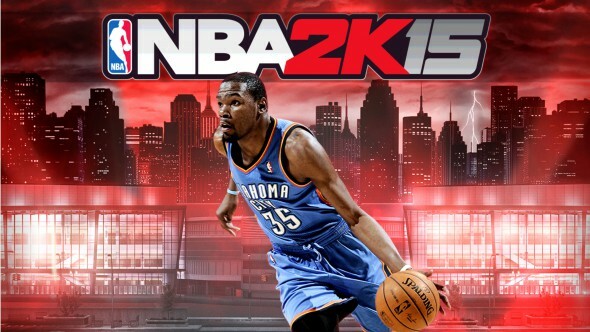 While NBA Live 15 was mostly underwhelming, and plagued by broken mechanics and nasty bugs, NBA 2K15 steps up to the plate and shows us how to do it the right way! In ‘my career’-mode starts out with your player watching television at home and NOT getting drafted! This cutscene features some hilarious dialogue with your slick agent, like the line ‘you are my best/last choice at the agency!’ This short introduction serves its purpose very well, and you start out 100% motivated to make your mouthy character’s dreams come true. A bit later (6 months of game time) we see our character sitting in the sofa, playing this very game, and talking to his agent about getting a ten day contract. At this point you get to pick a team to try out for, either making the cut, or having to go try out for another team, and you’re on the way to become a star! The dialogue and voice-acting make this very organic, and gets the player truly invested in their character. 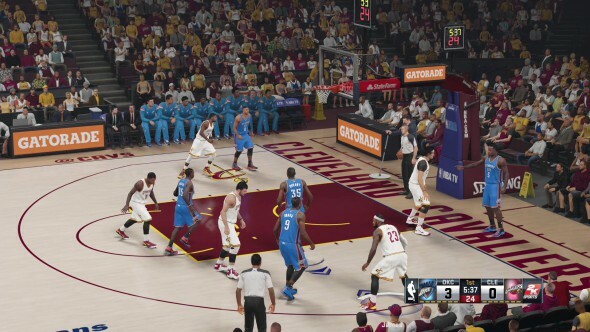 NBA 2K15 features the same graphics on all platforms, consoles and PC alike. While it looks decent enough on console, you can’t help but feel like a lot of PC horsepower gets wasted with this philosophy. One noticeable flaw standing out are some horribly jagged edges on the player’s clothing in certain cutscenes.A thing that is very well executed are the face scans, which really shine in the short cutscenes between games, but they lack in facial expression. These face scans are not limited to famous players, but can also be made by the player themselves with a camera accessory, leading to some very lifelike, and some very nightmarish results. 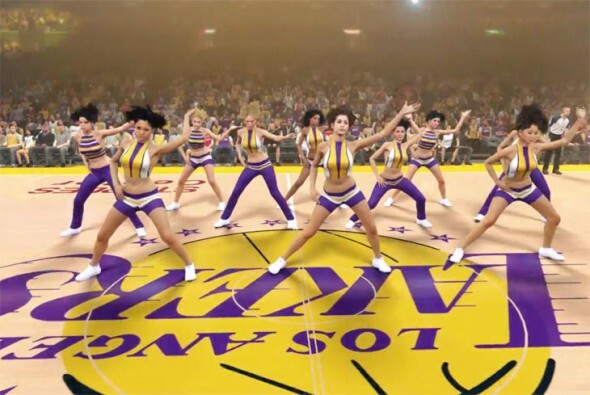 In the short segments between quarters we are treated to cheerleaders doing what they do best, another small factor that makes this game as immersive as it is. The commentators give a spot-on analysis of your game, and your teammates shout what they expect of you, so another +1 for immersion. 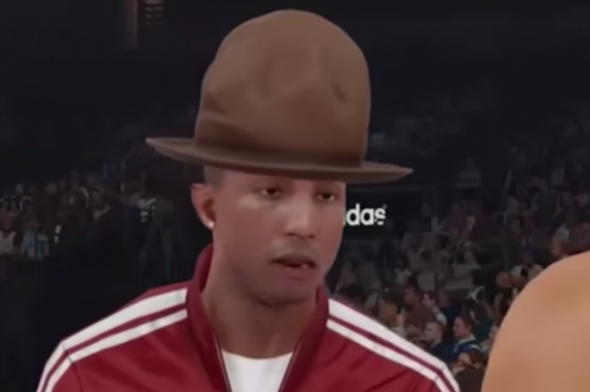 If you prefer to play along to some music, NBA 2K15 has got you covered with a great selection of music, put together by the one and only Pharrell Williams, featuring top tracks by artists like Snoop Dog, Depeche Mode, the Red Hot Chilli Peppers and of course, Mr Williams himself. Becoming a basketball star isn’t easy. So it’s a good thing NBA 2K15 allows you to practice your moves in the freeform/scrimage mode to learn the basics or hone your skills. Overall, it quickly becomes clear that the physics work like they are supposed to, your character reacts realistically and is very responsive to your input, there’s a lot of variety in moves to be made, you feel actually in control of your actions and missing a shot usually just comes down to poor timing or bad decision making. It really feels like a basketball game should, if you manage to keep an eye on the action that is. One thing that is not properly optimized is the camera angles, making you straight up guess where the ball is, or making it hard to control your character in an otherwise quite flawless experience. 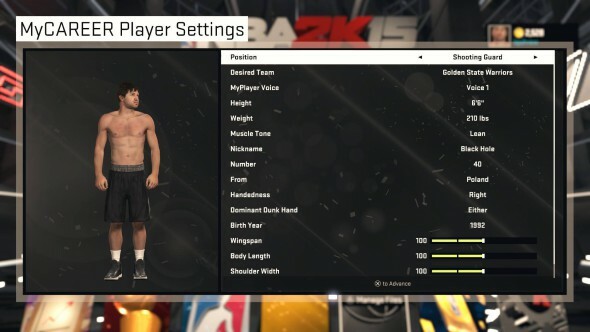 The number one feature sorely missed feature in EA’s NBA Live 15 must be the shot meter, which is very well implemented in NBA 2K15 and gives you all the feedback on shot success rate and timing you could ever want. Furthermore we have an AI actively trying to play a game of basketball, making their own plays and using the court to its full extent. Sidestepping at the 3-pointer line and scoring shot after shot won’t work here, you have to devise an actual plan of attack every time, and make use of your teammates. These actually feel like equals, and will deny pass requests as they see fit (especially when you still have to prove yourself as a newbie), making for a far more fluid experience. In the ‘my career’-mode, your performance gets graded, but surprisingly, this feels rather realistic. You don’t just get points as you score them, but instead you get better marks for making a good pass, good ball movement, defending your man etc. The whole experience fits right in with being a basketball player, which means playing in a team. You don’t only have to prove you can land a shot, but more importantly coaches have to see you as an addition to the team, increasing their overall efficiency. Other game modes let you have control of your own league, play with a crew of friends (only available on Playstation 3 and Xbox 360 for some reason), but these seem more side-attractions the main event that is singleplayer or local multiplayer. Managing to get things right where others have gone wrong makes for a very immersive and rewarding experience. NBA 2K15 managed to make a basketball game come to life with intuitive controls, making the game easy to get into and challenging to master. Although the graphics are held back by the slowest of the bunch, and sometimes not-ideal camera placement, the flow of the game, recognizable players and intelligent AI makes up for a lot. Featuring a fine selection of songs, and quasi unlimited replayability, it’s definitely a treat to play head to head with a friend. As far as basketball games go, they don’t come much better than this.